Dr. Bowers obtained his B.S. from Gonzaga University and his Ph.D. in 1966 from the University of Illinois. After two years at the Jet Propulsion Laboratory he joined the UC Santa Barbara faculty in 1968. His Awards include: the Nobel Laureate Signature Award of the American Chemical Society (1988), the Field and Franklin Award of the American Chemical Society (1996), the Thomson Gold Medal of International Mass Spectrometry Society (1997), a Guggenheim Fellowship (1995), and UCSB Faculty Research Lecturer (1994). Our research is centered on determination of the structure and/or reaction dynamics and reaction mechanism of a number of exotic species in the gas phase. These studies all utilize state-of-the-art ion beam technologies and methodologies, most of which were developed in our lab. The work is a blend of experiment and theory. We bring a chemical physics outlook to problems of chemical and biological interest. At present, we are involved in two broad areas: nanoclusters/materials and conformations, energeitcs and hydration of macromolecular systems. In the nanocluster/materials area, we are looking at size-selected metal clusters, their binding energies to catalytically important ligands and the connection to the same chemistry on clean semiconducter surfaces. The surface work is done in collaboration with Profs. Buratto, McFarland, Metiu and Moscovitz. Other projects include development of conducting organic films for use as LED's and other electronic devices (in collaboration with the Buratto and Bazan groups) and the hydration/dissolution energetics and mechanism of small sea salt clusters. We are interested in macromolecular systems of both industrial and biological importance. Industrial systems include primary and secondary structural/conformational mapping of both pure and copolymer systems. Of particular interest are polyhedral oligomeric silsesquioxanes (POSS), silicon/oxygen cages that greatly enhance polymer properties when attached. Biopolymer work has focused on the importance of conformational analysis, salt bridge formation and hydration of both peptides and oligonucleotides. This work continues. New projects are aimed at misfolding/aggregation phenomena that underlie many diseases, including Alzheimer's and various transmissible spongiform encephalopathies (TSE). Both experimental and theoretical approaches are being pursued. Many more details and a publication list can be found on the group web site. S. E. Anderson, C. Bleiholder, E. R. Brocker, P. J. Stang, M. T. Bowers, A Novel Projection Approximation Algorithm for the Fast and Accurate Computation of Molecular Collision Cross Sections (III). Application to Supramolecular Coordination-Driven Assemblies with Complex Shapes, Int. J. Mass. Spectrom. 2012 330-332:78-84. M. M. Gessel, S. L. Bernstein, M. Kemper, D. B. Teplow, M. T. Bowers, Familial Alzheimer’s Disease Mutations Differentially Alter Amyloid ?-Protein Oligomerization, ACS Chem. Neurosci. 2012 3:909-918. X. Zheng, M. M. Gessel, L. Wisniewski, K. Viswanathan, D. L. Wright, B. A. Bahr, M. T. Bowers, Z-Phe-Ala-diazomethylketone (PADK) Disrupts and Remodels Early Oligomer States of the Alzheimer Disease A?42 Protein,J. Biol. Chem. 2012 287:6084-6088. M. M. Gessel, C. Wu, H. Li, G. Bitan, J-E. Shea, M. T. Bowers, A? (39-42) Modulates A? Oligomerization but Not Fibril Formation, Biochemistry 2012 51:108-117. C. Bleiholder, T. Wyttenbach, M. T. Bowers, A Novel Projection Approximation Algorithm for the Fast and Accurate Computation of Molecular Collision Cross Sections (I). Method, Int. J. Mass. Spectrom. 2011 308:1-10. T. Wyttenbach , M, T. Bowers, Structural Stability from Solution to the Gas Phase: Native Solution Structure of Ubiquitin Survives Analysis in a Solvent-Free Ion Mobility Mass Spectrometry Environment, J. Phys. Chem. B 2011 115:12266-12275. N. F. Dupuis, C. Wu, J-E. Shea, M. T. Bowers, The Amyloid Formation Mechanism in Human IAPP: Dimers Have ?-Strand Monomer-Monomer Interfaces., J. Am. Chem. Soc. 2011 133:7240-7243. C. Wu, M. T. Bowers, J-E. Shea, On the Origin of the Stronger Binding of PIB over Thioflavin T to Protofibrils of the Alzheimer Amyloid-? Peptide: A Molecular Dynamics Study., Biophys. J. 2011 100:1316-1324. C. Bleiholder, N. F. Dupuis, T. Wyttenbach, M, T. Bowers, Ion Mobility-Mass Spectrometry Reveals a Conformational Conversion from Random Assembly to ?-Sheet in Amyloid Fibril Formation, Nature Chem., 2011 3:172-177. C. Wu, _M. 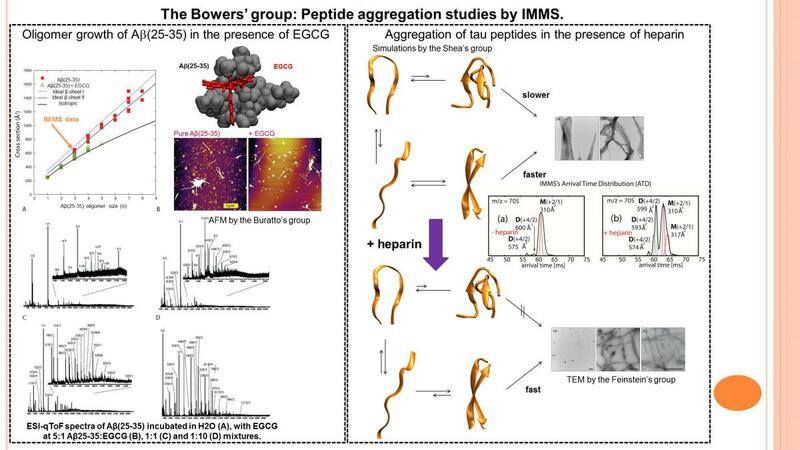 T. Bowers_, J-E. Shea, On the Origin of the Stronger Binding of PIB over Thioflavin T to Protofibrils of the Alzheimer Amyloid-? Peptide: A Molecular Dynamics Study., /Biophys. J./, 100 *2011* 1316-1324. N. F. Dupuis, C. Wu, J-E. Shea, _M. T. Bowers_, The Amyloid Formation Mechanism in Human IAPP: Dimers Have ?-Strand Monomer-Monomer Interfaces., /J. Am. Chem. Soc./, 133 *2011* 7240-7243. T. Wyttenbach , _ M, T. Bowers_, Structural Stability from Solution to the Gas Phase: Native Solution Structure of Ubiquitin Survives Analysis in a Solvent-Free Ion Mobility Mass Spectrometry Environment., /J. Phys. Chem. B/, 115 *2011* 12266-12275. C. Bleiholder, T. Wyttenbach, _M. T. Bowers_, A Novel Projection Approximation Algorithm for the Fast and Accurate Computation of Molecular Collision Cross Sections (I). Method., /Int. J. Mass. Spectrom./ 308 *2011* 1-10. M. M. Gessel, C. Wu, H. Li, G. Bitan, J-E. Shea, _M. T. Bowers_, A? (39-42) Modulates A? Oligomerization but Not Fibril Formation., /Biochemistry/, 51 *2012* 108-117. X. Zheng, M. M. Gessel, L. Wisniewski, K. Viswanathan, D. L. Wright, B. A. Bahr, _M. T. Bowers_, Z-Phe-Ala-diazomethylketone (PADK) Disrupts and Remodels Early Oligomer States of the Alzheimer Disease A?42 Protein., /J. Biol. Chem/, 287 *2012* 6084-6088. M. M. Gessel, S. L. Bernstein, M. Kemper, D. B. Teplow, _M. T. Bowers_, Familial Alzheimer’s Disease Mutations Differentially Alter Amyloid ?-Protein Oligomerization., /ACS Chem. Neurosci./, 3 *2012* 909-918. S. E. Anderson, C. Bleiholder, E. R. Brocker, P. J. Stang, _M. T. Bowers_, A Novel Projection Approximation Algorithm for the Fast and Accurate Computation of Molecular Collision Cross Sections (III). Application to Supramolecular Coordination-Driven Assemblies with Complex Shapes., /Int. J. Mass. Spectrom./, 330-332 *2012* 78-84. An Investigation of the Mobility Separation of Some Peptide and Protein Ions Using a New Hybrid Quadrupole/Travelling Wave IMS/oa-ToF Instrument Steven D. Pringle, Kevin Giles, Jason L. Wildgoose, Jonathan P. Williams, Susan E. Slade, Konstantinos Thalassinos, Robert H. Bateman, Michael T. Bowers, and James H. Scrivens Int. J. Mass Spectrom. 2007, 261, 1-12. Stabilization and Structure of Telomeric and c-myc Region Intramolecular G-Quadruplexes: The Role of Central Cations and Small Planar Ligands Valerie Gabelica, Erin Shammel Baker, Marie-Paule Teulade-Fichou, Edwin De Pauw, and Michael T. Bowers J. Am. Chem. Soc. 2007, 129, 895-904. Intermolecular Interactions in Biomolecular Systems Examined by Mass Spectrometry Thomas Wyttenbach and Michael T. Bowers Annu. Rev. Phys. Chem. 2007, 58, 511-533. Hydration of Mononucleotides Dengfeng Liu, Thomas Wyttenbach, and Michael T. Bowers J. Am. Chem. Soc. 2006, 128, 15155-15163. Elucidating Amyloid \u03b2-Protein Folding and Assembly: A Multidisciplinary Approach David B. Teplow, Noel D. Lazo, Gal Bitan, Summer Bernstein, Thomas Wyttenbach, Michael T. Bowers, Andrij Baumketner, Joan-Emma Shea, Brigita Urbanc, Luis Cruz, Jose Borreguero, and H. Eugene Stanley Acc. Chem. Res. 2006, 39, 635-645.